At Yellow Goat, we are always ready to help a brand make a big impact, especially when it comes to interior design. Our unique sculptures, wall creations, and lighting fixtures are the perfect solution for metropolitan companies looking to create a buzz through art. One brand that we were delighted to collaborate with is Sephora. Every makeup afficinado’s dream store wanted to create something a little different for their flagship locations in Vancouver and New York City. We were more than thrilled to add a little voom to their already exciting customer experience. Check out our awesome collaborations below! If you have been to Vancouver recently, you may have noticed that Robson Street is booming. Vancouver’s internationally recognized shopping destination has come a long way from the drab retail stores and tourist restaurants that it had during the 2010 Olympics. From opening an exciting new Victoria’s Secret (it’s massive and multi-level) to cutting out all the smaller chain stores that were underperforming, Robson Street is regaining the fashion-forward reputation it had in the 80’s. All the stores that are staying are undergoing huge design transformations. One of the new big projects that’s creating waves among Vancouverites is the new Sephora. Sephora used to be crammed in a small location underground in Pacific Centre. Now this popular makeup destination has performed a makeover on its own image, and the results are astounding. Moved to a prime street location on Robson, this new and exciting location is unrecognizable. Yellow Goat was delighted to be part of this transition. We were excited to work with the large scale ceilings that were available to us in this prime location. 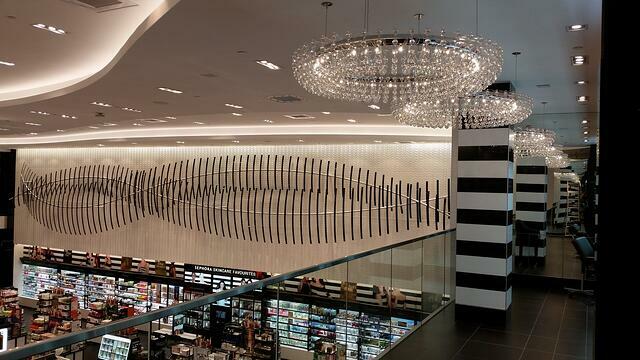 We wanted to create a piece that gave a nod to Sephora’s iconic black-and-white striped logo (which is also used on the walls in this location) while creating an artistic focal point that would emphasize the new trendy and international image of this location. The custom sculpture created for this space features 2 satin finished aluminum tubes and 146 aluminum composite arms that form two curvaceous ribbons. This sculpture, deemed “Chrysalis,” is unique and artistically compelling while still referencing Sephora’s unique branding theme. For Sephora’s New York location, we created a sophisticated and glamorous light fixture that emphasizes the city buzz of Times Square. Our “Besa” fixture features oval shaped satin polished aluminum hoops dripping with crystal strands, creating a luxurious ballroom effect. Each hoop is suspended inside and above the other. On the inside of the hoops, a dramatically hung shower of internally lit LEDs completes the illusion of frozen rain. 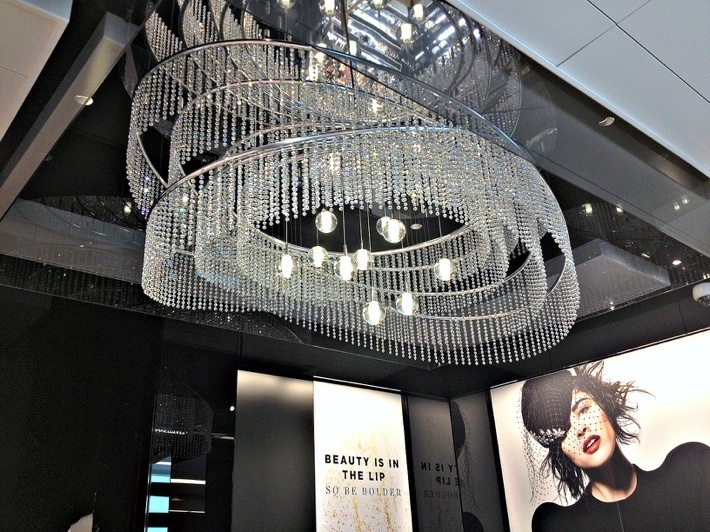 This dazzling fixture highlights the unique personality of Times Square and Sephora’s relationship with the location. At Yellow Goat, we love using our unique style to highlight the image of a well-known or local brand. Our style brings a trendy and upscale feeling to a brand that sets it apart from the traditionally marketed business. The best marketing plans make space for art that is valuable on its own merits and harness that universal appeal to draw positive attention for a business. If you have a space in your business that could use world-class quality design, give Yellow Goat Design a call. We’ve got tons of experience working with brands to create a unique and seamless customer experience – we’re here to make your space stand out!